1st row: Catherine Davis, Lori Jenne, Lucinda Flanagan, Rose LaPoint. 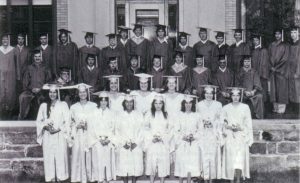 2nd row: Barbara Hundley, Cynthia Ruslow, Sherry Hull, Shelli Prespare, MaryBeth Partlow, Cheryl McCollum, Deborah Farr. 3rd row: Eric Oelshlager, Scott Harmer, Gregory Jenne, Roger Tresidder, Gerald Snell, Timothy Clarke, James Knowlden, Thomas Collins, Kenneth Davis, Robert Blackmer. 4th row: Bryan LaPoint, Wayne Corbine, Christopher Robertson, Robert Nagle, Frederick Whitmarsh, Joseph Allen, Spencer Farr, Kevin Wallace, Kent Deese, Robert Hance, Eric Edie, Pernell Curtis, Ricky Colton, Tracy Durham, Daniel Clarke, David Smith.